Konnekt provides all hardware, personalization, setup and testing for your Konnekt video phone. Simply tell us your contacts’ names and numbers, and we do the rest! We customize the call buttons and all other options. We even help your contacts get going, and optimize their video calling. We don’t like to deliver until we’re sure that everyone’s experience will be of the highest quality. Lift Videophone out of the box, unfold the kickstand, and plug it in to any power socket. For most customers, that’s it. There’s nothing to switch on, adjust, or get wrong. There’s no need for you EVER to charge any batteries, connect or disconnect anything. Your Videophone just works… just like a regular home telephone, but easier. Konnekt manages Videophone’s “unlimited calls” subscription. For most users, Videophone sits on a low table beside the “favourite chair.” We can even recommend or supply a small sturdy table. Once you’re happy with the position, stick down the kickstand using our adhesive clamp. 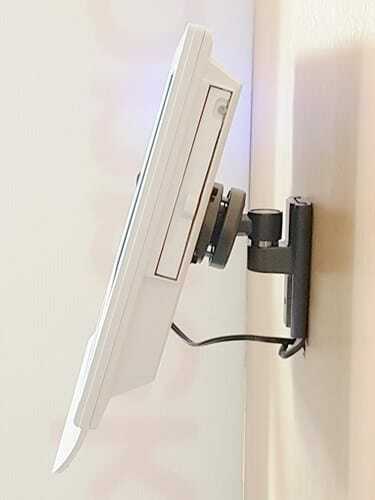 Some prefer Videophone mounted on a wall so it can see the whole room. Konnekt can recommend or supply a bracket or a flexible arm. 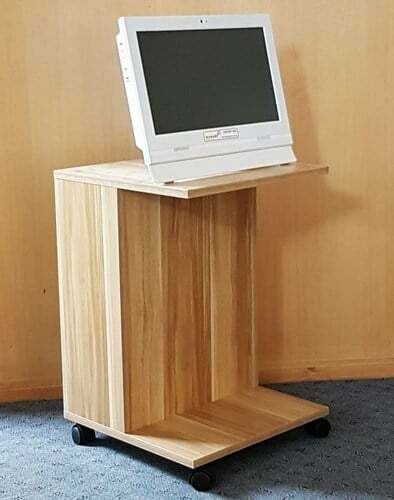 Videophone can also mount onto a chair or bed frame. In some countries, we offer custom installation. 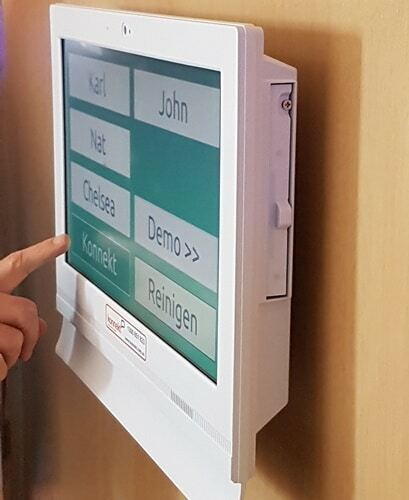 We pre-configure Videophone to automatically connect to your Wi-Fi / Internet. Alternatively, plug it into any modem/router. Or use our simple guide to set it up to talk to your Wi-Fi. Need help? We talk you (or your friend) through setup, no matter where you are. Don’t have Internet? We can help you select a suitable service. Videophone uses hardly any data and works with any Internet including 3G/4G mobile (cellular) Internet, ADSL or Cable. 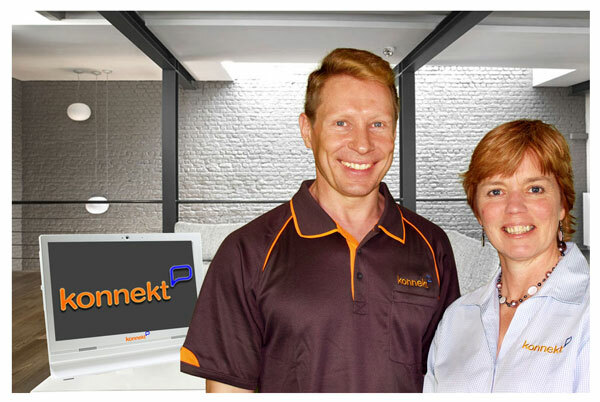 In Australia, we recommend our Konnekt Internet for greater quality and service. In Australia, Konnekt offers ADSL2+ or NBN broadband, with backup links in our network for higher reliability, and lower contention ratio for high speeds during busy times. We include an award-winning NBN-ready Wi-Fi modem-router that we configure and optimize to provide up to double the up-link bandwidth to improve video quality. We’ll support your Internet locally so you won’t experience any frustrating overseas-call delays or language gaps that you get from some call centres. Where fixed Internet is not practical, and for short-term rentals / trials, we can recommend or provide pre-configured mobile Internet. Plug in and go! We prefer to set you up with our own Internet so that you have one point of contact and great support. Whether it’s your Videophone or Internet, a single number to call provides one-stop help. For our customers outside Australia and those who prefer to organize their own Internet, we can recommend or help you select a suitable fixed Internet or mobile Internet service. Usually, a quick call to your phone or cable provider will add Internet to your services for about a dollar a day. Videophone simply connects to the modem/router using either a LAN cable, Wi-Fi (configured easily or pre-configured by us), or via an extender. This means your video phone can usually be located in any room you want. We include an easy guide with pictures, and we can arrange a time to talk you or your friend/relative through setup. We provide full I.T. support on-the-phone or via Skype, text or email. Whether you’re in America, Asia-Pacific, Europe or Africa, we’ll help. Poor English? We use off-the-shelf translation apps that work surprisingly well. Our entire philosophy is to make everything easy and reliable. Most of our customers are sons, daughters or carers who live interstate or overseas, who cannot or do not wish to be slaves to a gadget. We get it. Our customers worldwide are delighted by our service. Read what customers say.